Real consumer spending has been anything but gangbusters in recent months. If that doesn't reverse course, retail stocks could take a hit this summer. With the Amazon (AMZN - Get Report) beast breathing down their necks, the last thing struggling retailers need is a cautious U.S. consumer. Yet, that's exactly what they have gotten in recent months -- and if it persists, retail stocks are likely to take it on the chin this summer. Real consumer spending took a nosedive in the first quarter (chart below) as consumers assessed the impact President Trump's tax reform plan. Not helping matters was a more volatile stock market, rising inflation and a cooling U.S. labor market. In turn, consumer sentiment has remained stuck in a range since February. Retail stocks have followed suit. The VanEck Vectors Retail ETF (RTH - Get Report) is down about 7% since hitting a high on Jan. 29. This week has brought bearish notes on department stores like Macy's (M - Get Report) from Wall Street shops, citing fears of online competition and challenging first quarter sales conditions. Macy's CEO Jeff Gennette will be speaking at TheStreet's sister publication, The Deal's, big corporate governance in June. "We think that real consumption growth will firm from 1.1% annualized in 1Q to 2.3% in 2Q. 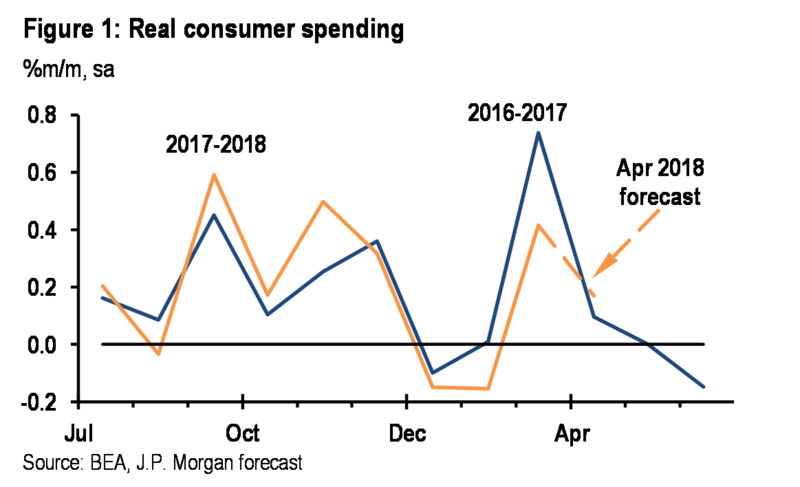 We continue to see similarities between this year and last that likely are related to abnormal patterns of tax refunds, and like last year, we expect real consumer spending to firm noticeably between 1Q and 2Q," says JPMorgan & Chase strategist Daniel Silver. But even Silver doesn't sound 100% convinced. "But inflation likely will be much stronger in 2Q18 than it was in 2Q17, and higher prices should dampen real spending and erode some of the benefits associated with lower taxes." Go buy some tech stocks. Where'd all the spending go?